This month’s cocktail comes from a request by my friend Colette, who asked for a recipe for a purple cocktail. I think it’s because she went to Northwestern. I’m a little annoyed because Northwestern beat my Michigan State Spartans last weekend. But I like Colette far more than I like football, so she gets her recipe anyway. A lot of purple cocktails end up looking reddish purple, like red wine. 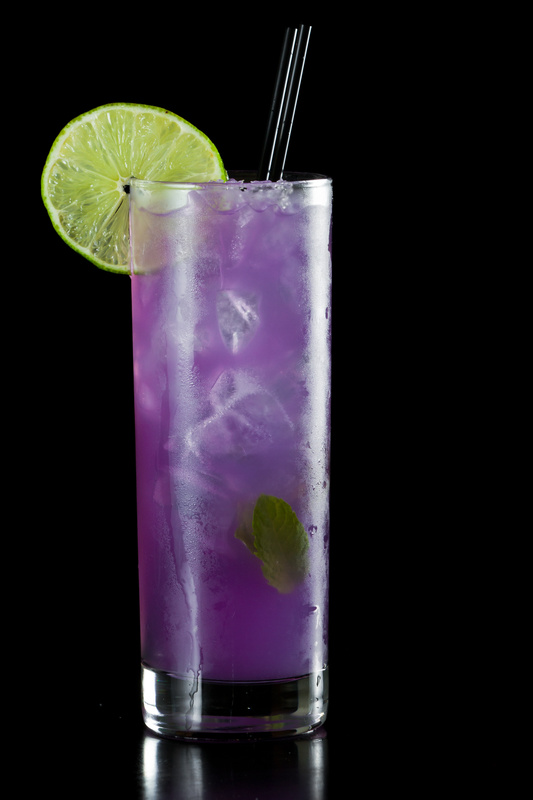 She was looking for a mixed drink that was more of a blue-based purple. Something regal and dramatic. But I digress. Some Purple Rain recipes insist the grenadine be added last. The idea is that the redness of the grenadine floating down through the blue of the other ingredients creates the rain. But the Cocktail Spy is going to keep it simple for you. With this recipe, you can mix everything all at once and start enjoying the results right away. Ready to try it? Here we go. Combine all liquid ingredients in a cocktail shaker and shake. Pour the mixture into a highball glass filled with ice. If you have a lime, cut off a wedge or wheel to use as a garnish, and squeeze in fresh juice from the remainder. By the way, I’m happy to pick out a mixed drink for you, too! Tweet your requests to @cocktailspy, post them on Facebook at CocktailSpy.com, or email them to thecocktailspy[at]gmail.com. For more top recipes, click here, or check out some of our previous cocktails of the month below.